Do you have Melbourne ancestry? Directories are an extremely useful tool for establishing when and where a person lived however this is just a starting point, look further in the directory to find out more information about the society in which they lived, the occupation they held and the people they knew. These directories include advertisements which provide useful insight, often including names of people and places. Each directory including most text in the ads is searchable. This makes it useful not only for finding names but also places, occupations and other information for family and local historians. Directories are one of the most effective ways of tracing members of a family, especially tradesmen. Many small businesses needed to ensure the public was aware of their activity and one of the better ways to do this in an age before media dominated was via a directory. The value of directories as a research tool is enhanced when no census material is available. Each directory contains varied information, details on what is included for each year are below. This directory covers the areas of Melbourne proper, East and North Melbourne, Collingwood, Richmond and the business portions of Emerald Hill, Sandridge and Williamstown. It is divided into three sections. The first contains a street guide and directory indicating shop names, owners and where they’re located. There is also an alphabetical directory sorted by surname giving occupation and address. Thirdly, there is a professions and trades directory, also giving names and addresses. The directory also contains an advertisement section containing information on advertisements from companies throughout the state at this time. 1860 saw the fourth edition of Sands, Kenny & Co's Commercial & General Melbourne Directory. Localities covered for the business portions of the directory include: East Melbourne, North Melbourne, Carlton, West Melbourne, Fitzroy, East Collingwood, Richmond, Prahran, St Kilda, Emerald Hill, Sandridge, and Williamstown. The full title of this directory is 'Sands, Kenny & Co's Commercial & General Melbourne Directory for 1861'. Localities covered are: East Melbourne, North Melbourne & Hotham, Carlton, West Melbourne, Fitzroy, East Collingwood, Richmond, Hawthorn & Kew, Prahran, South Yarra & Windsor, St Kilda, Emerald Hill, Sandridge and Williamstown. Sands and McDougall's (along with Wise's) are the best known, and most comprehensive directories that were produced for various Australian colonies. Using the Street directory will give you the names of the householder street-by-street for Melbourne and suburbs. The Alphabetical directory lists everyone alphabetically by surname, together with their occupation, and address. It lists thousands of names of those working and residing in Melbourne in 1862. 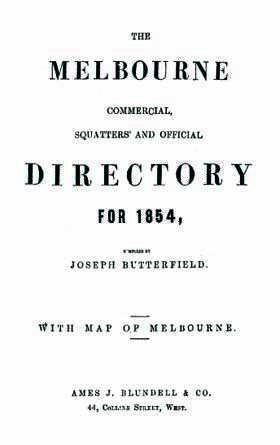 The full title is "Sands and McDougall's Melbourne and Suburban Directory for 1865 containing street, alphabetical, and trade directory Melbourne and suburbs, together with a miscellaneous directory of useful information". Localities covered include Alphinton, Brighton, Brunswick, Collingwood (Fitzroy, East Collingwood), East Melbourne, Emerald Hill, Essendon, Flemington, Footscray, Hawthorn and Kew, Heidelberg, Ivanhoe, Melbourne, North Melbourne (Carlton, Hotham), Northcote, Pentridge, Prahran South, Preston, Richmond, Sandridge, St Kilda, Toorak, West Melbourne, Williamstown, Yarra and Windsor. These large Sands and McDougall directories are known to be amongst the most comprehensive available. This directory covers both Melbourne and its suburbs, including: Melbourne proper, Ascot Vale, Boroondara, Brighton, Brunswick, Carlton, Caulfield, East Collingwood, East Melbourne, Emerald Hill, Elsternwick, Elwood, Essendon, Fitzroy and Fitzroy North, Flemington, Footscray, Hawthorn, Heidelberg, Hotham, Jolimont, Kensington, Kew, Malvern, Moonee Ponds, Newmarket, Northcote, Oakleigh, Pentridge, Prahran, Preston, Richmond, Sandridge, St Kilda, Studley Park, South Yarra, Toorak, West Melbourne, Williamstown, and Windsor.They contain an immense amount of information for the genealogist and historian alike. This Melbourne Directory lists the names and professions of many people in Melbourne and suburbs in 1875. This directory covers both Melbourne and its suburbs, including Melbourne proper, Alphington, Ascot Vale, Bolingbroke, Boroondara, Box Forest, Brighton (East, South and North), Brunswick, Camberwell, Camden Town, Carlton and Carlton North, Caulfield, Cheltenham, Coburg, Collingwood, East Melbourne, Elsternwick, Elwood, Emerald Hill, Essendon, Fitzroy and Fitzroy North, Flemington, Footscray and Fitzroy Upper, Gowerville (Preston), Greenwich, Hartwell, Hawthorn, Heidelberg, Hotham, Irishtown, Ivanhoe, Jolimont, Keelbundora, Kensington, Kew, Malvern, Moonee Ponds, Mulgrave, Newlands, Newmarket, Northcote, Norwood, Oakleigh, Parkville, Prahran, Preston, Richmond, Sandridge, St Kilda, South Melbourne, South Yarra, Thomastown, Toorak, Westgarthtown, West Melbourne, Williamstown, Windsor, Yarraberg, and Yarraville. "The accompanying plans have been prepared by Messrs. N. Billing and Son, architects. The estimated cost of each building includes all charges in connexion with the erection thereof ..."
The directory includes the following information listed, and concludes with over 70 pages of advertisements which all useful insight, often including names of people and places. This 1893 Sands and McDougall directory contains nearly 1500 pages. Apart from the Street, Alphabetical, Trade and Professional directories, this volume also contains Government and Official, Ecclesiastical, Legal, Municipal, Colonial, Societies and Institutions directories. This directory covers Melbourne city and its suburbs, which consist of: Abbotsford, Albert Park, Alphington, Armadale, Ascot Vale, Balwyn. Bolingbroke, Box Hill, Braybrook, Brighton, Brighton East, Brighton South, Broadmeadows, Brunswick, Burwood, Camberwell, Canterbury, Carlton and North Carlton, Caulfield, Cheltenham, Clifton Hill, Coburg, Collingwood, East Melbourne, Elsternwick, Essendon, Fairfield, Fawkner, Fitzroy, Fitzroy North, Flemington, Footscray, Glen Iris, Glenroy, Hawksburn, Hawthorn, Heidelberg, Ivanhoe, Jolimont, Keilor, Kensington, Kew, Maidstone, Malvern, Mentone, Moonee Ponds, Mordialloc, Mulgrave, Newlands, Newmarket, Newport, Northcote, North Melbourne, Oakleigh, Parkville, Port Melbourne, Prahran, Preston, Preston South, Richmond, Sandringham, South Melbourne, South Yarra, Spottiswoode, St Kilda, Surrey Hills, Toorak, West Melbourne, Williamstown, Windsor, Yarraberg, and Yarraville. Using this directory will give you the names of the householder street-by-street for a number of suburbs. This is an invaluable genealogy tool for exploring your Melbourne family history or building your family tree, and a fascinating glimpse for social historians.